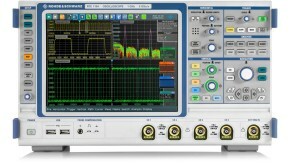 The R&S®RTO / R&S®RTE digital oscilloscope is a valuable tool for analyzing EMI problems in electronic designs. High input sensitivity, high dynamic range and a powerful FFT implementation are key features for capturing and analyzing unwanted emissions. When debugging electromagnetic interference (EMI) problems, the electronic design engineer faces the challenging problem of identifying the sources of unwanted emissions and developing a solution for them. Often, the only information that comes back from the EMC test laboratory is a spectrum curve indicating the frequencies where emissions are critical or violating the limits. Repetitive testing at the EMC compliance laboratory to identify and resolve the problem is costly and often significantly delays the product launch. 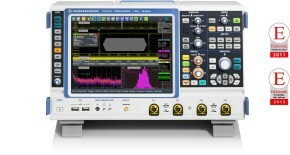 The R&S®RTO/RTE digital oscilloscope is a powerful instrument for debugging EMI problems on the design engineer’s desk. 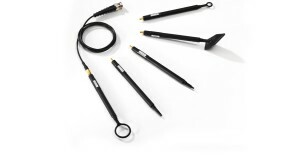 In combination with a near-field probe set it allows the designer to quickly locate and analyze EMI problems. High dynamic range and high input sensitivity of 1 mV/ div ensure that even weak emissions can be analyzed. The R&S®RTO/RTE fast Fourier transformation (FFT) implementation provides a fast update rate and the FFT frame overlay processing and persistence display allow insights into the structure of unwanted emissions. This helps the designer to quickly detect the source of the emission. 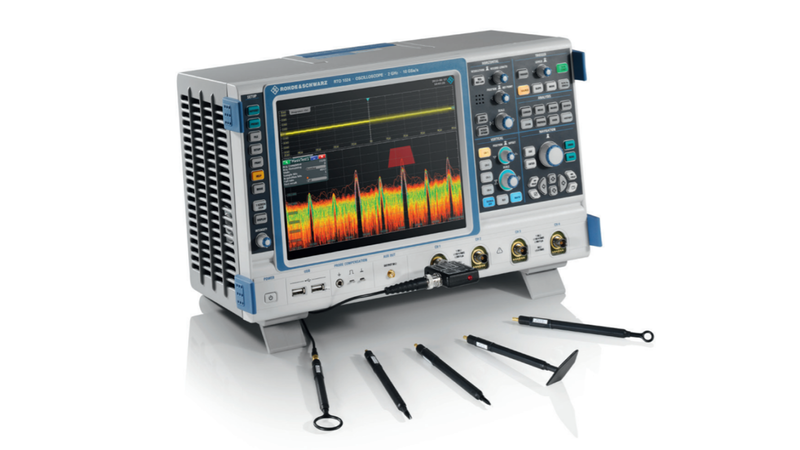 Rohde & Schwarz offers the compact R&S®HZ-15 near-field probe set, which is particularly helpful for EMI debugging of embedded designs. The most compact probe in this set allows capturing of near-field emissions from single circuit lines. The R&S®HZ-15 covers the frequency range from 30 MHz to 3 GHz. It can be also used below 30 MHz, with reduced sensitivity. The optional R&S®HZ-16 preamplifier provides a gain of 20 dB in the frequency range from 100 kHz to 3 GHz, in case higher sensitivity is needed. Easy navigation in frequency domain with a familiar spectrum analyzer interface. 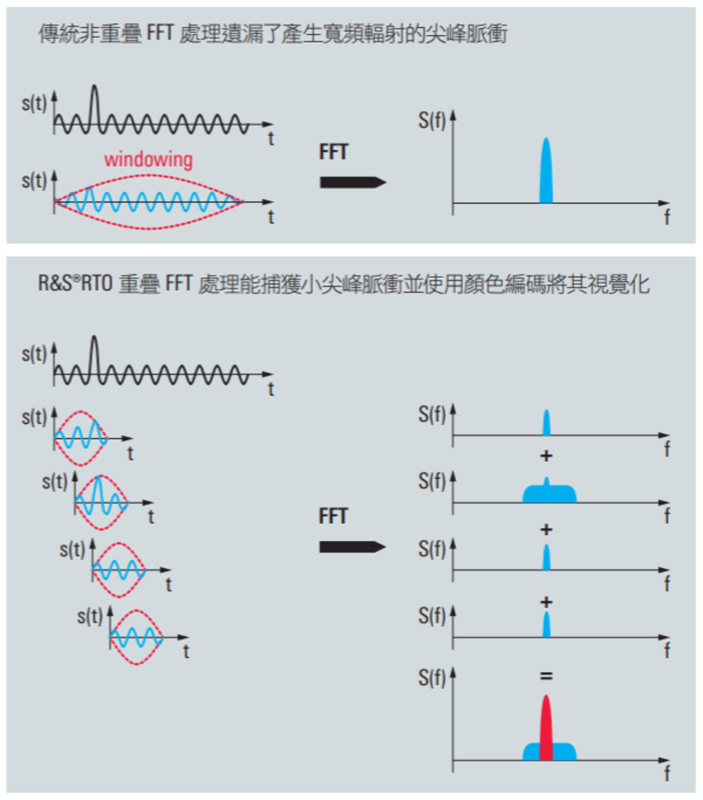 The R&S®RTO/RTE FFT has the familiar interface of a spectrum analyzer. 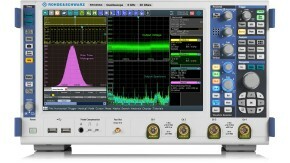 The FFT setup dialog offers basic spectrum analyzer controls such as start and stop frequency and resolution bandwidth. In the FFT mode, the R&S®RTO/RTE automatically adjusts time domain settings accordingly. This makes navigation in the frequency domain an easy task. The captured time domain signal is also available for analysis at the same time. The maximum FFT capture bandwidth corresponds to the R&S®RTO/RTE model’s bandwidth. For example, the R&S®RTO1044 allows a quick overview of all the test device’s emissions from 0 Hz to 4 GHz. 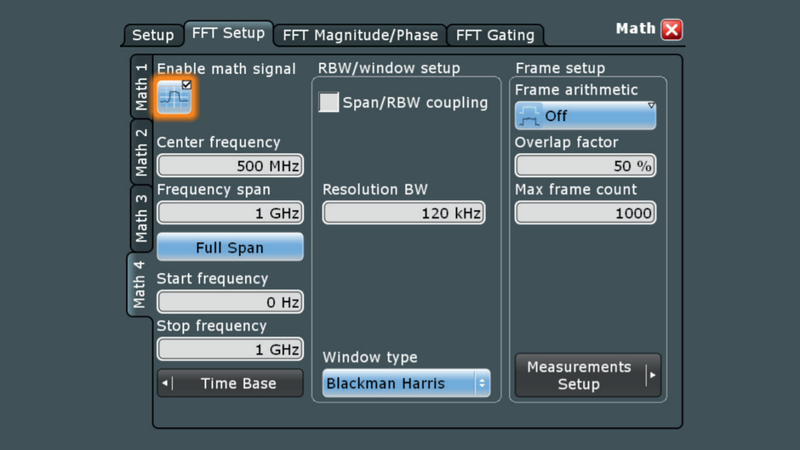 Capture sporadic events with the frequency mask function. The overlap FFT implementation in the R&S®RTO/RTE first automatically splits the captured time domain signal into overlapping segments. In a second step, it calculates the FFT for each segment in order to display intermittent signals such as pulse type interferers. Color coding the resulting spectral lines according to their frequency of occurrence visualizes the intermittent signals. With the gated FFT function, it is possible to restrict the spectrum analysis to a user-defined region of the captured time-domain signal. Excessive spectral emissions can be correlated to dedicated time periods in a signal. Typical applications include the correlation of unwanted emissions to fast switching edges in switched-mode power supplies or to data transfers on bus interfaces. Having identified the problem, the design engineer can easily check the effectiveness of different solutions such as blocking capacitors or reduced rise/fall times by observing the level change of the spectral emission. Intermittent or sporadic emissions are the most difficult to debug. They are difficult to capture and not easy to analyze. The R&S®RTO/RTE mask tool allows these events to be captured. 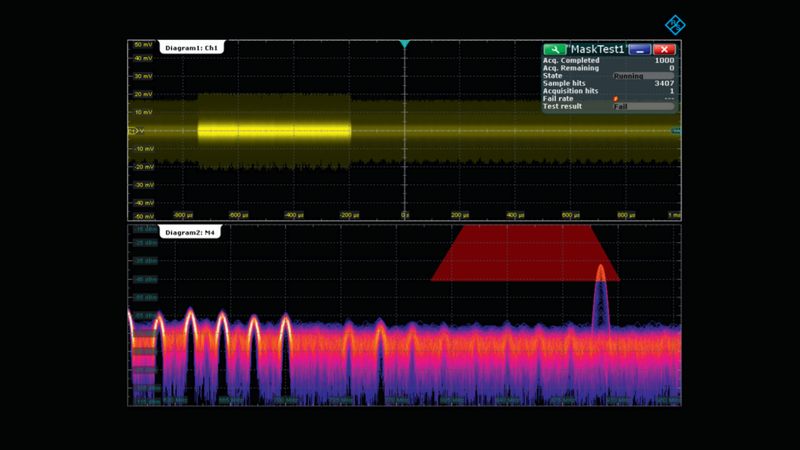 Once the mask is violated, the acquisition stops automatically and the user can adjust FFT settings such as resolution bandwidth or gate and use additional tools such as cursors for more detailed analysis.